On September 25, 2014, Muriel S. Robinette ‘74, was presented with the 2014 CEPS Distinguished Alumnus Award at the annual Scholarship Awards Ceremony held at the Memorial Union Building. The award was presented by CEPS Alumni Society President Genise Bonacorsi ‘94. Muriel’s engagement with CEPS and the University began during her studies as a geology student; she graduated from UNH in 1974 with a B.A. in geology. Muriel continued her studies at Washington State University, where she earned an M.S. in engineering with a concentration in groundwater, and at the University of Idaho, where she studied mining engineering. After her Ph.D. studies, Muriel remained at the University of Idaho as a member of the faculty, working as an assistant professor of geological engineering, and then became interim director of the Idaho Mining and Minerals Resources Research Institute, leading their Strategic Minerals Initiative. Muriel left academia and joined the public sector in 1982, serving in federal regulatory roles as a consultant to agencies that included the Nuclear Regulatory Commission, Bureau of Mines, and the Environmental Protection Agency. 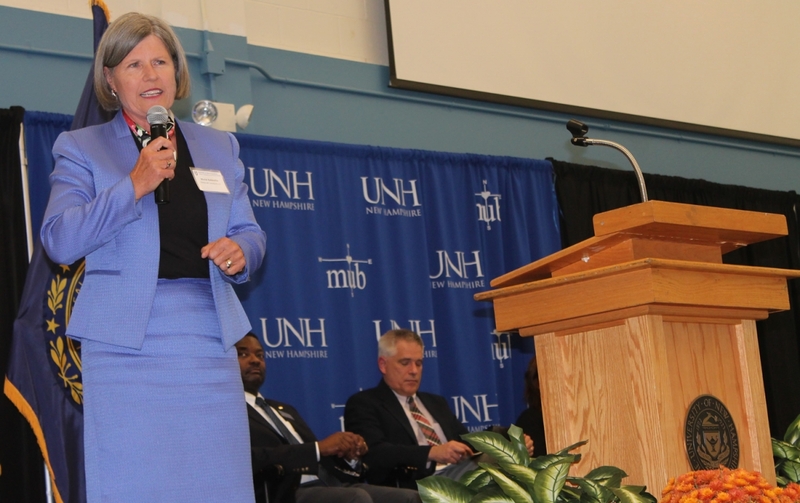 She also served the state of New Hampshire as director of the Water Supply and Pollution Control Commission’s Hydrological Investigation Unit and is currently a member of the New Hampshire State Board of Professional Licensure. In 1986, Muriel transitioned to the private sector and worked in key leadership roles at a number of consultancies, including GEI Consultants, Inc., Haley & Aldrich, Inc. and New England EnviroStrategies, Inc., a firm that she founded and sold to Terracon Consultants, Inc. in 2013. Muriel has consistently challenged the status quo, becoming the first female board member for two $50 million companies. A nationally recognized groundwater forensics expert, Muriel is currently Senior Principal and Senior Environmental Hydrogeologist at Terracon Consultants, Inc., which provides technical consulting, engineering, and expert testimonial services related to environmental compliance, remediation, and contaminated property redevelopment. Muriel is also strongly committed to public service. In addition to her efforts with UNH and CEPS, she has served on the Board of Directors and Executive Committee of the New Hampshire Lakes Association, Secretary and member of Board of Directors of the NH Geological Society, and she currently serves on the Board of Trustees of the Lakes Region Conservation Trust and as a member of the Lake Winnipesaukee Watershed Association. Muriel has also been active in town government and in her church. Muriel credits values of hard work, compassion, integrity, and proactive focus on action, as well as the support of her family with her success. She expresses her passion for nature and the outdoors in her personal life as well; Muriel is an avid horseback rider and enjoys camping, hiking, skiing, and sailing.